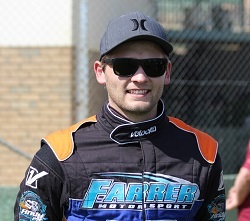 Brenten Farrer will begin his 2018/19 season campaign this Saturday night (October 13) at the Avalon Raceway as he contests the opening round of the Eureka Garages & Sheds Sprintcar Series in his #V34 Frijtek Maxim. Over the past couple of season’s Brenten has concentrated his racing efforts in the 360ci division, where he captured a 360ci Allstars Series Championship, but this season his focus will be the 410ci class, with only a select number of events scheduled for the smaller capacity division. “I’m really looking forward to a fresh start. Making the next step is something that I’ve wanted to do for several season’s and I am now in a position to do so thanks to my loyal and fantastic supporters. They have been really supportive of my ambition to move up” added Brenten in the lead up to the Avalon event. “During the off season our Farrer Motorsports 410ci engine was sent to Maxwill Motors in Adelaide and it has had a lot of work done and I can’t wait to put it use. I will try to get to as many 410 shows as our budget allows and in between I will still drive the Porkers Transport 360ci Maxim, so we are set for a busy season”. Although Brenten missed last weekend’s official SRA Practice at Avalon last weekend he will still go into this weekend with some recent seat time after a shake down run at the Heartland Raceway at Moama a fortnight ago. “We were very happy with how the run at Moama went. One of the best things I ever did was meet Pete Morris. The engine performed perfectly and I can’t wait to get out there and mix it with some of the best Sprintcar drivers in Australia this Saturday night”. Brenten would like to thank the following corporate supporters for their involvement in the 2018/19 Sprintcar Season: Frijtek Industrial Refrigeration, Porkers Transport, B&G Clancy Farm Contracting, Ayross Racing, B.A.T Training and Assessments, Maxwill Race Engines, PRP Engineering, JB Speedway Spares, BF Car Carriers, Brack Earthmovers and Phil Michell Motorsport Media.